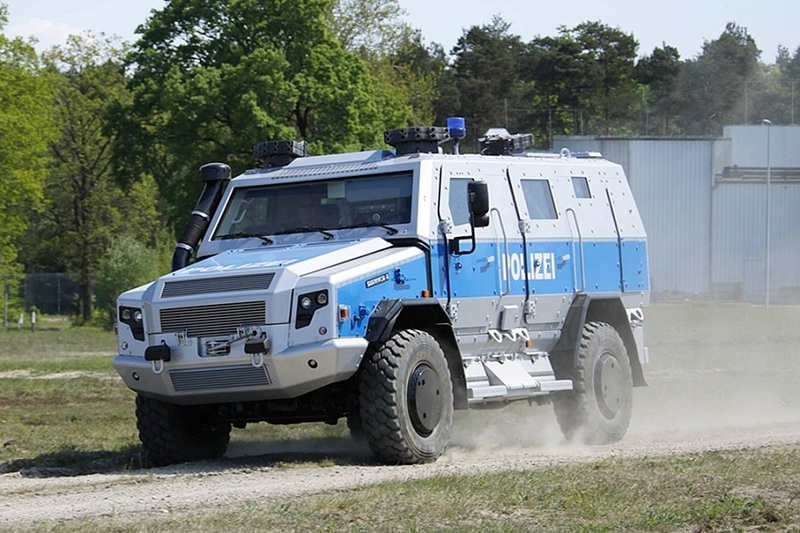 The Berlin Police Department has received a heavily protected Survivor R special operations vehicle. The vehicle was ordered in September 2017 as part of a package of counterterrorism measures. It was configured for the needs of the Operations Directorate of the Berlin Police, according to BulgarianMilitary.com. Survivor R is a high mobility vehicle by Rheinmetall, developed in cooperation with Austrian special vehicle maker Achleitner. The vehicle is especially suited for police SWAT team operations, intended for use in high-risk situations where operators need to be safely transported; or persons evacuated. The vehicle can accommodate up to 10 crew members including various personal and command equipment. The Survivor R combines mobility, protection and payload to provide an optimal solution for modern armed Special Forces in different operating environments. It is designed in civil appearance which can be customized by optional equipment packages, according to different police requirements. The Survivor R is based on a high-performance 330hp (242kW) 4 x 4 truck chassis, an expertise of MAN and Achleitner. It can reach a speed of over 100 km/h. The vehicle is equipped with an armoured crew compartment combining proven series production and automotive components with state-of-the-art protection technology. It is one of the most cost-effective solutions available today. The armored steel hull can be armored with adaptive protection elements to counter changing threat scenarios. The gas-tight monocoque can be equipped with a CBRN ventilation system to protect the crew against nuclear, biological and chemical warfare agents. An auxiliary heating and a powerful air conditioning system provide a comfortable and ergonomic operational environment throughout the whole year. The internal seating arrangement and stowage concept can be adapted and customized according to customer-specific requirements. This according to rheinmetall-defence.com. The Survivor R CBRN is equipped with fully automated detectors for nuclear radiation as well as sensors for identifying chemical warfare agents and other hazardous materials. These include a remote standoff sensor for detecting distant clouds of chemical agents, providing immediate analysis and warning. The vehicle has cost-effective logistics and low life-cycle costs and a worldwide logistic support. Its special equipment includes a dozer blade, hydraulic winch (100kN), protective grids for windows, tyre shields, non-lethal effectors, search lights and an adjustable ramp system.